Abu Sufian – who is also known as The Silent Poet – is a poet, writer and social worker whose writings have appeared in many national and international publications that include newspaper, magazine, literary journals and books. Sufian currently lives in Kuala Lumpur, Malaysia and he can be reached at his official Facebook poetry page, The Silent Poet (facebook.com/Sufian.Author). During his undergraduate years when he studied English literature as an academic subject, he fell in love with the poetic world. Finishing his bachelor, he moved to Malaysia in 2013 and recently he earned his MA degree in English literature. During his Master’s study, he has been exposed to Sufi poets like Rumi, Saadi Shirazi, Hafiz, Omar Khayyam. His poems have been greatly influenced by these Sufi and mystic writers and have been published in literary journals including Scarlet Leaf Review, Criterion, Literary Voyage, The Literary Herald, Tuck Magazine, Clairvoyance, and also in the poetry anthologies, Voice of Monarch Butterflies (2016) and Apple Fruits of an Old Oak (2016), Dandelion in a Vase of Roses (2017). All these anthologies were published in USA. His poems have been accepted for publications in a bilingual poetry anthology Where Are You From? which is expected to be published in May 2017. Welcome to Scarlet Leaf Review, Abu Sufian! Scarlet Leaf Review: Tell us a little about yourself and your background. Abu Sufian: First of all, thanks for taking this interview. It is a great pleasure for me to be interviewed by Scarlet Leaf Review. I was born in Comilla district of Bangladesh. Since my school years I have been a curious boy. I studied science in my school, and then I moved to college to study business studies. Although I liked literature since my school days, I never thought in a million years that I would become a writer or a poet someday. I did my bachelor in English language and literature, and this gave me an opportunity to read literature more extensively and dive deep into the literary realm. I was amazed by Robert Frost’s magnificent poems; Shakespeare’s enthralling plays; Jane Austen’s reformative novels; and many as such. However, beside my study, I worked as a journalist in Bangladesh for a few years. In 2013, I moved to Malaysia to pursue higher education. SLR: Do you think that your school years have had an impact in your writing career? If so, what were you like at school? AS: Yes, indeed. I think everyone’s school days are remarkable and unforgettable; so are mine. And school years have great impact on whatever you do later in your life, because that’s where our mind’s ideas are initially formulated. I am not an exception. I can mention one thing in particular: studying science in school have had a great impact on my writing. Although I quit science and moved to other areas of studies, what I learned about physics, chemistry and biology has been very genuinely stuck in my mind. So, I continued my journey of own to know more about science, our world, life and the universe at large, going beyond the academic study and classrooms. You will see many references of scientific things in my poems and writings. I am very happy about it and that is what makes my school years so dear and important to me. SLR: Were you good at English or like Einstein you excel now in a field that was a nightmare for you as a student? AS: I was good at English compared to my peers during my school and college years. Over the years, I tried to improve my English as it was the medium of my study both in my undergraduate and in Master’s. By the way, Einstein is my most favorite scientist after the great astronomer Galileo. SLR: What are your future ambitions for your writing career? AS: When it comes to literature, I don’t aim for any material gain as it is very close to my heart and I nurture creative works as something that will serve the society by entertaining and reforming. So, there is no monetary ambition. My ambition mainly is to transcend some of my messages that I want to convey to the society. And I believe literary works are the most effective ways to influence and reform people’s mind. Other than composing poetry, I am also interested in writing novels and short stories which you will see in coming years, hopefully. In a nutshell, my ambition as a writer and poet is to reform society in a positive way without getting any material gain from it. SLR: Which poets have inspired you and how? What was their impact on your work or your literary perspective? AS: This is my favorite question to answer. I would divide it in two segments: first, the writers who made me love literature and the ones who inspired me to write. Firstly, my love for literature is formulated and fueled by some poets from my motherland (Bangladesh) and some English writers. Among the Bengali (national language of Bangladesh) writers, Kazi Nazrul Islam, Sufia Kamal, Begum Rokeya, Jahir Raihan, Rabindranath Tagore and many more. The English writers include T. S. Eliot, Robert Frost, Jane Austen, John Keats, Tennessee Williams, Eugene O'Neill, Virginia Wolf, Arthur Miller, Walt Whitman, and many more to count. Secondly, the poets and writers who inspired me to write are not the English or Bengali writers; they are the Sufi writers. In 2014, during my Master’s study, I studied legendary Sufi poets and mystics Rumi, Omar Khayyam, Hafiz, Sa’adi, and Shams Tabrizi. These great poets actually very much formulated and convinced me to write more and more. Although I used to write poems when I was eight, I never thought to get my works published till I am exposed these Sufi writers. I never experienced anything like that before in my life. Their writings are unbelievably enthralling and there are no words to explain the depth and gravity of their poems until and unless someone read their poems and try to comprehend the ideas himself/herself. SLR: So, would you mind telling us what you have written so far? AS: So far, I have mainly composed poetry, both in English and Bengali (also known as Bangla) and two short stories. Among the poems, I have about 70+ poems that were published in books and literary magazines. I have not published my short stories yet. However, as I am researcher of English literature, I also produce critical writings that include journal articles, newspaper articles, book reviews, interviews and so on. The readers may have a glimpse of my critical writing at https://iium.academia.edu/AbuSufian. 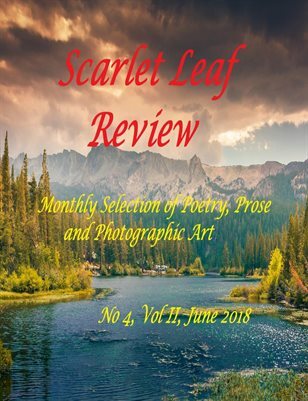 So far, my poems have been published in literary journals including Scarlet Leaf Review, Criterion, Literary Voyage, The Literary Herald, Tuck Magazine, and Clairvoyance. My poems also got published in the poetry anthologies, Voice of Monarch Butterflies (2016) and Apple Fruits of an Old Oak (2016) and Dandelion in a Vase of Roses (2017), these anthologies were published from USA. Some poems have been accepted for publication a bilingual poetry anthology, Where Are You From? It is supposed to be published in May, 2017. SLR: Where can we buy or see them? SLR: What are you working on at the minute? What’s it about? AS: Currently I am working on some short stories. Writing poems – in both English and Bengali – is something I do on a regular basis. I have been invited by some journals to submit poems, I am working on it. I am planning to start of writing a novel. Hopefully, I will start it soon after the gestation period of thinking process and a little of research. SLR: What genre are your books and what draws you to this genre? AS: As per as genre is concerned, I follow the postmodern trend. Literature should be open and diverse, there should not be any set rules that writers should follow. In the early 19th century, the romantic poets successfully broke the long-standing tradition of “order, accuracy, and structure” of the Neoclassical period (1660 – 1798), and thus the Romantic Era (1798–1832) brought a tremendous change in literary thinking. If we still follow rigid structure or genre, then we will go backward in history. So, I don’t want to subscribe my work into any genre. But if you want to define it, my poems would fall under the genres of narrative, satirical, haiku, prose poetry and so on. I have plans to write some science fiction novels in future. SLR: When did you decide to become a poet? What was the decisive factor or you just took a pen and starting writing poems? AS: I think to become a poet does not have much to do with decision or planning as we do it related to many other stuff in our life. It is something like an Epiphany, a feeling and/or a moment of truth. There is an urge deep inside the heart that wants to speak out for truth and beauty. As per as I am concerned, I got the real inspiration from the legendary sufi poets to compose poems and publish. I would especially like to mention the Sufi poets Jalaluddin Rumi (1207–1273), Omar Khayyam (1048–1131) and English poet Robert Frost (1874–1963). Apart from these inspirations, personally I also felt an indomitable urge from within myself to speak out against the corruption and the human sufferings all around the globe. I was thinking a way out to spread my words, and I found poetry as a very powerful tool through which I can inspire many people and thus transcend the ideas I have in my brain. SLR: What makes you write? What’s the force behind taking your pen and put verses down? AS: Again, I would say the urge that I feel from within. I feel a strong sense of responsibility as I consider myself to be privileged with a pen and paper, and food in my mouth. Many people in the world can’t even eat 3 times a day, millions of people are homeless. 1 out of every 7 people living on this planet go to bed with hungry stomach; 20,000 children die every day due to malnutrition (according to UN). Having seen all these statistics and the sheer horror they bring along, I could not resist me. I am not a politician, nor am I a wealthy person; so, I can’t fix this thing directly. That’s why I decided to write and raise human consciousness. SLR: Do you write full-time or part-time? Do you have a special time to write or do you write everyday, 5 days a week or as and when? AS: I am a part-time writer now. Writing is not my profession, I outlined above why I am eager to write. From my part, there is almost no monetary ambition when it comes to producing literature. I don’t have any specific time, but I love to write at night, especially late at night when most of the people are at sleep. It is a great experience of waking up the whole night and at the end of the night you start writing. SLR: Where do your ideas come from? Or is it just the spur of the moment, a special feeling you experience or a specific conjuncture that offers you inspiration? AS: I am not sure where do they (ideas) come from. In my childhood, I heard that, ‘ideas come from God’. I am not sure about ideas’ origin: is it a human mechanism resulting from our biological evolution of the brain, or does a divine source put the ideas in human brain? However, I am sure that ideas exist and they are the key players in whatever we do as human race. My ideas are inspired by a number of things. They include: a movie, a song, a poem, a piece of art, a painting, a photograph, a moment of joy/sadness, an experience and a dream. I don’t see any specific conjuncture, maybe a photograph could be so. SLR: How do you think you’ve evolved creatively? AS: Relying on undeniable scientific evidence, I believe it very strongly that all living things evolve and everything evolves including humans, plants and the universe at large. But to be honest, I have not noticed how I have evolved creativity. It is so spontaneous and unplanned process that it is tough to detect the nature of creative evolution. It is something like growing up from infancy to boyhood, and boyhood to adolescence. You know you are growing up, but you can’t detect the process. SLR: In your opinion, what is the hardest thing about writing? AS: I think the hardest thing about writing is to force the brain to write when it is exhausted, and some occasions, to forget an amazing idea which you previously planned to write something on. SLR: Now, what about the easiest thing about writing? AS: I think there nothing easiest in writing. It’s all about hard work, pushing yourself and strong sense of commitment to society. SLR: Do you ever get writer’s Block and if so do you have any tips on how to get through the dreaded writer’s block? AS: Yes, many times in a year I suffer from ‘writer’s block’. I handle it so nicely that it is no more a problem for me. I simply stop writing and try to go somewhere far from where I live, somewhere close to nature. Nature can heal it so perfectly. In the case of ‘writer’s block’, my simple advice for other writers would be: stop writing and go to nature. SLR: Do you read much and if so who are your favorite authors? For your own reading, do you prefer eBooks or traditional paper/hard back books? AS: As a student of literature, I read a lot of literary stuff. In last few years I have given my focus to many other areas other than literature. The areas include philosophy, science, theology and psychology. It is difficult to give a short list of writers as favorite. However, they include Reza Aslan, Tariq Ramadan, John Hick, Richard Dawkins, Yuval Harari, Alain de Botton and Paulo Coelho. Though I read lots of soft copies, I prefer traditional paperback books. SLR: What book/s are you reading at present? AS: Currently I am reading Excellence Without a Soul by Harry Lewis. SLR: Do you proofread/edit all your own books or do you get someone to do that for you? AS: At the moment, I myself do the editing. SLR: What are your views on social media for marketing? Which social network worked best for you? Any tips on what to do and what not to do? AS: As I can observer, Facebook is an effective medium for promotion or marketing as it has over a billion users worldwide. Publishers can run ads in Facebook to attract more people to buy their books. SLR: What is your favorite motivational phrase? What is your favorite positive saying? SLR: What advice would you give to your younger self? AS: Don’t let yourself be convinced by the ideas that are not true. SLR: Which famous person, living or dead would you like to meet and why? AS: I would love to meet the Sufi poet Rumi. He was a great human being. Till today, he is an inspiration for billions of people. I like honesty and truthfulness in a writer. Rumi does not pretend to know all the truths about life, world and the universe. He tried to know and showed his ignorance and inability to fathom the truth. This is why I like him. SLR: What advice would you give to aspiring writers? AS: Write with honesty and truthfulness. Your writing should spread love and kindness in people. That’s all. SLR: Where do you see publishing going in the future? AS: It is very evident. The publishing norms will change radically in a about a century’s time. Almost all the publishing will be online publication. Hardcopies will be outdated. SLR: Is there anything else you would like to add that I haven’t included? AS: Yes, you might ask me about people who helped and inspired me to publish. I would like to thank the editor and poet, Soodabeh Saeidnia. She is a very good friend of mine as well. Her contribution to my writing career is immense and incomparable. She inspires me every step of the way and helps me to get my works published in poetry anthologies that she edited. I can never repay her selfless care and support for my creative writings. Secondly, I would like to thank the editor Michael Lee Johnson who is a great inspiration. Other than this, my friends, family members and most important of them all—the readers who read and like my poems, send me emails, like my Facebook poetry page and thank me for my poems. SLR: How can readers discover more about you and you work? SLR: Thank you very much for taking the time out of your busy schedule to take part in this interview.